Podcasting represents a type of digital media that allows you to create audio content, organize it into an episodic series of audio files that can be subscribed to and downloaded through web syndication or streamed online to a computer, lap top, netbook, tablet, or mobile device when it is convenient to the listener. Generate conversations through storytelling, sharing information, and interviewing others. Create, curate, and market content. Advocate and promote causes and campaigns that promote social change, social good, social justice, and other issues. Market and promote events, products, and services. Develop thought leadership expertise and speaking skills. Gather research and document best practices. Podcasting entered Digital Sisterhood Network founder Ananda Leeke’s life as a content marketing strategy for her first novel, Love’s Troubadours – Karma: Book One in 2007. When Leeke held her first online book party for Love’s Troubadours on Myspace, she used her radio experience as a volunteer calendar reader for WPFW 89.3 FM to develop a podcast series with Gcast, a free mobile software application. Her podcasts featured excerpts from her novel, reflections about her writing process, and event notices about book readings and author talks. 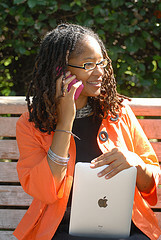 The more she recorded and posted podcasts with her cellphone to her author blog and member pages on various Ning.com social networking sites, the more connected and engaged she became with her audience. Through her active participation in Black Author Showcase social networking site, she learned about Talkshoe.com and BlogTalkRadio, web-based radio platforms, and was inspired to create two Talkshoe shows, BAP Living Radio and Go Green Sangha Radio, in 2008. That same year, she decided to strengthen her podcasting skills by attending Podcasting 101, a workshop taught by Fanshen Cox and Heidi Durrow, the founders of Mixed Chicks Chat, at the Blogging While Brown Conference. The workshop exposed Leeke to Utterli, a mobile micro-blogging tool that she began using to post weekly audio blogs about her creative adventures as an artist and an author. She also used Utterli to live blog and conduct interviews at events, meetups, and conferences. In 2009, she began using BlogTalkRadio and Cinchcast, a micro-blogging tool, to host author chats and to promote her book, That Which Awakens Me: A Creative Woman’s Poetic Memoir of Self-Discovery. She also launched Digital Sisterhood Radio to document the accomplishments of women in social media and to discuss feminism online. To date, Cinchcast has become her favorite podcasting tool to use with her smartphone as she live blogs and conducts interviews at conferences, events, and meetups. Visit Ananda Leeke Cinchcast – http://cinch.fm/anandaleeke and Digital Sisterhood Radio – http://www.talkshoe.com/tc/42015 (series will return in late 2012). Are you ready to launch a podcast or Internet radio show? If yes, check out Leeke’s 14 tips for launching a podcast or Internet radio show below. 1) Listen to several podcasts and Internet radio shows to get an idea of how they are organized and hosted. 2) Take time to answer the why, what, how, who, and when podcasting questions. Why do you want to launch a podcast? What themes will your podcast focus on (general themes, episode themes, and guests)? How will you host your podcast (podcasting platforms such as BlogTalkRadio, Cinch.fm, and Talkshoe.com)? Who is your audience (gender, age, ethnicity, geographical location, lifestyle choices, profession etc.)? When will you launch your podcast and how often will it air (5 minutes, 15 minutes, 30 minutes, or 1 hour on a daily, weekly, or monthly basis.)? 3) Create a name for your podcast that supports your brand (blog, web site, social media sites, book, products, and services). 4) Select a podcasting platform (i.e. BlogTalkRadio, Cinch.fm, and Talkshoe.com) that accommodates your schedule, finances, and technical skills. 5) Decide if your podcast will include audience participation with questions from a chat room, phone, Twitter, Facebook, etc. 6) Determine if you need a digital producer or assistant to help you manage the podcast (introduction, questions in chat room and from guests, live tweeting etc.). Select individuals who are reliable and are able to commit to your schedule. 7) Develop an episode schedule with themes, guests, and back up guests. Make sure your themes allow you to provide original content or present content in an original way. 8) Spend time making your podcasting site look visually stimulating with your logo or photo and a clear and concise description of the program’s themes, episodes, and guests. 9) Contact guests well in advance to schedule interviews. Use face-to-face meetings at events, a phone call, Twitter, Facebook, Google+, other social media sites, or email to make the initial contact. Follow up with an email that includes a brief introduction about your show (if they don’t know about it), detailed instructions on how to access the podcast, interview questions, additional information about other guests, your contact information, and a request for the guest’s contact information (web site, social media sites, and phone number). You may also want to ask the guest for a short bio (200 words or less) and a photo for promotion of the show in a blog post. 10) Promote your podcast on your web site, blog, video blog, and social media sites, and wherever your audience hangs out online. Schedule your notices in advance (post a full schedule in advance and monthly or weekly reminders). 11) Practice using your podcasting platform several times before your first show. Set up mock interviews with others to practice your interview and hosting skills. Record the shows and listen to them to learn how you can improve your skills. Ask others to listen to the recordings and provide feedback. 12) Know that your podcast will evolve over time. So be patient with yourself as you learn and grow. PS: Guess what? 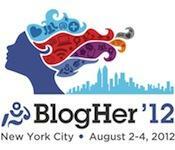 Leeke will be moderating a Podcasting 101 Panel at BlogHer on August 3 from 1:15 p.m. to 2:30 p.m. at the Hilton New York in New York City. Her co-panelists are Deborah Shane and Jasmin Singer, two amazing women who rock the web with their Internet radio and podcasting skills. Click here for more details. Check out the Podcasting 101 Pinterest Board for resources. Hi! I’ve been reading your weblog for a long time now and finally got the courage to go ahead and give you a shout out from Huffman Texas! Just wanted to tell you keep up the great job! Thank you Selma for leaving a comment.